The amphora appears in the Beazley Archive (BAPD 350425). This provides the history sequence as follows (though in the list of auction catalogues seems to confuse Sotheby's and Christie's). Note that the sequence does not quite match the one provided by Christie's. 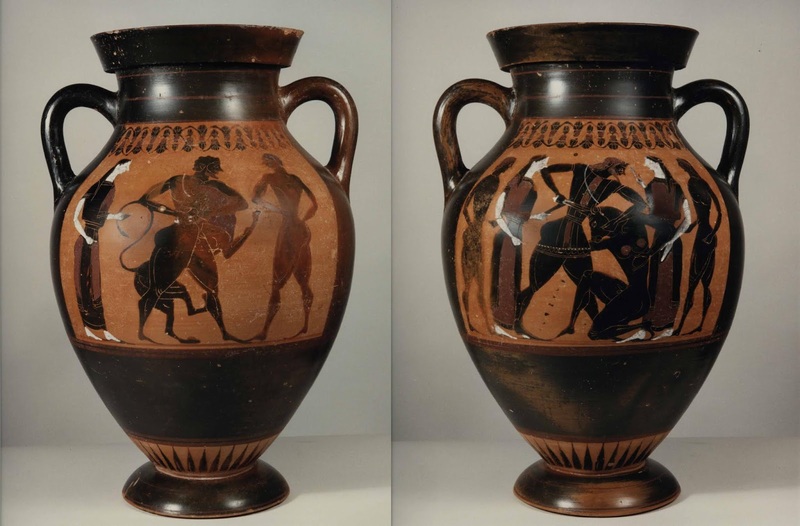 Cambridge-based researcher, Dr Christos Tsirogiannis, has spotted that the amphora appears in the Schinousa archive. He also observes that the photographs of the amphora in BAPD show salt deposits, perhaps indicating that the amphora had only recently emerged from its context. These also contrast with the photographs in the Schinousa archive that appear to have been taken after conservation / restoration. When did the amphora reside with Robin Symes? Was this the European private collection? Or was this the London private collection between December 1996 and June 1998? Or are these private collections different again? The amphora was known to Sir John Beazley and was listed by him in 1971. It is, however, surprising that the auction catalogue entry and the BAPD record do not coincide more closely. And the amphora's presence in the hands of Robin Symes adds to our knowledge of how the amphora passed through the market.